Born into a family of collectors, I grew up in a home filled with art and antiques inherited from my mother’s family: Philadelphia Chippendale; Baltimore Federal furniture; and paintings by Winslow Homer, Maurice Prendergast, and Childe Hassam. Our house reflected the Williamsburg/Winterthur style, and our world was painted Hammond-Harwood green. I was the only one of four sons to get the collecting bug, and like most collectors, I started out early, displaying Steiff stuffed animals on a spare bed and coveted objects such as knives, antique pistols, beer cans, and lead soldiers on a wall of bookshelves (I am still teased today for not using bookshelves to hold my books). It was during visits to my grandmother’s house in Wilmington, “Goodstay,” an 18th-century house acquired by my family in the 1860s, that I truly became an antiques enthusiast. Although the house was a treasure trove of exquisite objects, it was not much fun for a small boy until I discovered a huge third-floor attic space. Trunks, suitcases, and boxes sealed for generations were filled with objects that had belonged to my ancestors. Rooting around and unearthing precious items in that attic fifty years ago, I decided I wanted to be involved with the antiques world one way or another. I pored over my parents’ stacks of the Magazine Antiques, reading articles as well as ads and learning the terminology of the art and antiques world. As a junior at Washington & Lee, I was asked to help catalogue the important Reeves porcelain collection, gifted to the university in the 1960s. I sorted through hundreds of pieces of 18th- and 19th-century porcelain (mostly Chinese export) under the tutelage of Director James Whitehead—whose enthusiasm was infectious—and fell in love with armorial porcelain. With a $500 check from my parents on my 21st birthday, I purchased a beautiful pair of armorial plates at Georgetown’s Peter Mack Brown Antiques. After college I worked in insurance and banking but longed for the antiques world, even opening a shop in Middleburg, Virginia, in 1978. I was barely able to eke out a living, and it became obvious I loved to buy beautiful objects but hated to sell them! In 1982 I was invited to attend a Decorative Arts Trust meeting at Washington & Lee to celebrate the opening of the Reeves Center (the new home for the ceramic collection), and the lecturers were a “Who’s Who” of the Chinese export world: Crosby Forbes and Bill Sargent from the China Trade Museum, Carl Crossman, Pamela Copeland, dealer/scholar David Sanctuary Howard, and collectors Jim and Nancy Flather. I learned more that weekend than I had in ten years prior and discovered that my little collection needed to evolve. David Howard inspired me to always buy the best I could afford, noting that dealers loved to work with serious collectors and would be happy to spread out payments if necessary. 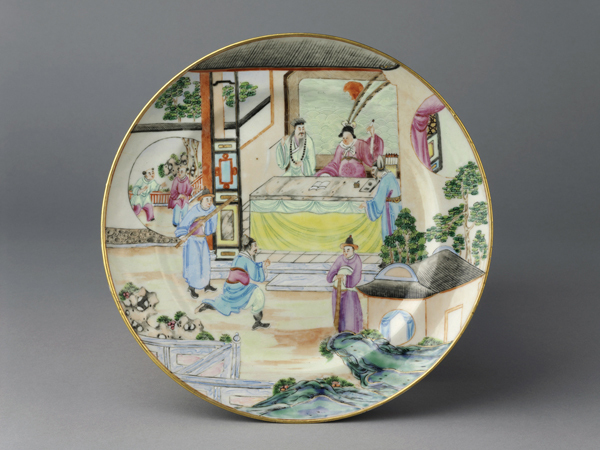 This charger, which was made in Jingdezhen, China, ca. 1725, is decorated with the arms of John Haldane of Gleneagles, Scotland. It is the earliest documented example of an armorial porcelain design based on a bookplate. In 1983 Jim Flather, a dedicated Chinese export porcelain collector and lecturer at the symposium, offered me a position with his insurance agency, where I would develop the firm’s book of fine arts insurance for collectors, museums, and dealers. Paid to associate with people who loved the same things I did, I could now afford to buy the wonderful objects for which I had a passion. Win-win! Post by Bruce Perkins, President of Flather & Perkins, Inc., and an inveterate collector and longtime member of the Winterthur Board of Trustees. The 51st Annual Delaware Antiques Show takes place November 7–9, 2014, at the Chase Center on the Riverfront in Wilmington, Delaware. For show tickets or more information, please call 800.448.3883 or visit winterthur.org/das. Tickets are also available at the door. View the 51st Annual Delaware Antiques official Show Catalogue. Collecting antiques is an art form. Please enjoy ‘Tips for New Collectors‘ by Forbes Maner, Delaware Antiques Show Committee Member, highlighting the rules of thumb from an experienced collector. This entry was posted in Events and tagged 51st Annual Delaware Antiques Show, Armorial Porcelain, Baltimore Federal furniture, Bill Sargent, Bruce Perkins, Carl Crossman, Childe Hassam, China Trade Museum, Chinese Export Porcelain, Crosby Forbes, Davis Sanctuary Howard, Decorative Arts Trust, Delaware Antiques Show, Delaware Antiques Show Catalogue, Director James Whitehead, Flather Perkins, Forbes Maner, Goodstay Wilmington, Hammond Harlow, Jean-Paul Barbier, Jim Flather, John Haldane, Magazine Antiques, Maurice Prendergast, Nancy Flather, Pam Perkins, Pamela Copeland, Peter Mack Brown Antiques, Philadelphia Chippendale, Reeves Collection, Steiff, Tips for New Collectors, Washington & Lee University, Williamsburg, Winslow Homer, Winterthur. Bookmark the permalink. It’s been 55 years since we last saw each other at A.U. I was an art major and remembering being at your home with those wonder columns and the grand piano in the living room and was overwhelmed. We also took a trip to Winterthur where you pointed out to the management that they had mislabled a chair that was on display! You made quite of an impression and that’s why, when I came across the article from last year, I had to send you a note. Thank you Ned for your note.